Yes, that is Mother’s Day, so bring your Mom and enjoy some tasty food trucks! If this is your first time attending one of our events, be sure to read our tips & tricks. We’re not quite ready to announce the lineup just yet, but there will be no shortage of options. Stay tuned to our website for the list of trucks, menus, and more in the coming days. It has been amazing for me personally to see the food truck scene in Edmonton grow since we held our first event way back in June 2011. Last year we worked with nearly 100 different food trucks, which is even more incredible when you consider that a number of them have closed or transitioned into brick-and-mortar restaurants over the last few years. If you’re starting a food truck and want to get involved, you can join What the Truck?! here. One of the ways we help food trucks is by connecting them with hundreds of event opportunities every year using our Book the Trucks form. This year we’ve decided to run a few less of our own events and will instead focus primarily on promoting the trucks and other events. We are getting ready to share more on that soon. 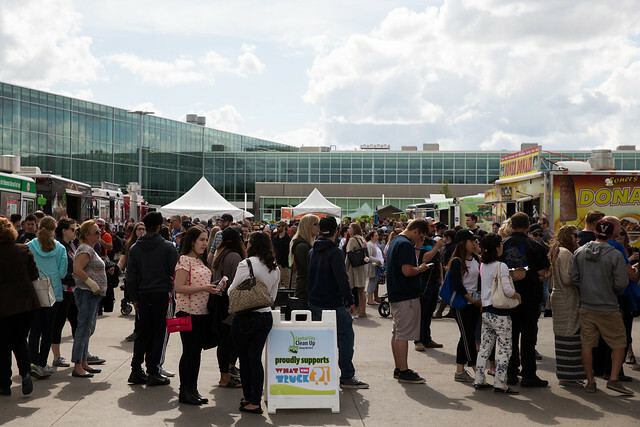 Keep up-to-date on food trucks in Edmonton by following What the Truck?! on Twitter, Facebook, and Instagram. And to see where the trucks are, be sure to download the Street Food App. See you on May 14 at Northlands!